Peretz Chein did the right thing! Circus Tent: Shluchim running marathons; am I out of touch? The value of exercising on a regular basis would have been a more than worthy purpose of Rabbi Chein's marathon. However, this was not even the crux of Rabbi Chein's message! You missed the larger picture, even while alluding to it in your post. I am a recent graduate of Brandeis University and had personal contact with Rabbi Chein as he was preparing for the marathon. The primary message that he sought to instill in his student's was this: nothing is impossible. To a man that had not participated in organized sports since he was age 13, to complete a marathon within the year was literally almost impossible. Yet he persevered.In doing this he demonstrated to his students that nothing is impossible. As Rabbi Chein once put it, he asks his students to push their limits, to "do the impossible" all the time, and now he was showing us that that it can be done, and that we can do it. attending a regular Torah class, even to attending a single Shabbat meal, to be mekarev, in some small way, yidden around us,...even when we never thought we had it in us. Nothing is impossible, not after the Rabbi ran a marathon. I don't think there could be a more worthy, beautiful, "Torahdik" and "Chabad" message than that. Finally, regarding your comment about his looking like a "spaceman" during the race, I don't see it. But regardless, I am certain that Rabbi Chein would look like a "space man" again in a heartbeat, and anytime, if that is what it would take to hammer home this beautiful message to even one more of his students. Shouldn't every shliach? A view that his example was anything other than positively inspiring is, yes, simply "out of touch." It came to mind after hearing the song a few times: What kind of Yid was this Alter Menashe? He sits and learns Mi'toch Dachkus, and doesn't seem to be fazed by the fact that he has no idea how to put food on the table, never mind the fact that he has no way to marry off his two fine daughters. He just puts his head back down and continues learning Mit Hislahavus. I imagine Zlate his wife just throws her hands up in despair. So why would I have a problem who learn Teyreh MiToch Mesiras Nefesh, and who's stomach rumbles for food? I have no problem, really, zol em voyl bakoomen. Here's the issue: Meileh the man Menashe has the Gemoroh to quiet his stomach. He can be whisked away to the world of Abaye VeRovo and never realize that he has a family to feed. Aye he has a family to feed and he promised his wife under the Chupah that he's provide for her? We can leave that issue for another time. He's been taught well, and has faith, he's sure Hashem will provide for him just like he does for all others. Ober Zlate? Vos zol zi tohn? Mer fun di Tehillim un Tze'enoh Ure'enoh ken zi nit leynen, and maybe that's a stretch as well, so how does she drown her sorrow? What does she go back to? Then there's the issue about Menashe's answer to Zlate's question. He`tells her that a "Yiddishe Tochter tohr nit fregen keyn kashes", a Jewish daughter may not ask questions on what G-d does or will do. What about a Jewish man, may he ask? may he question the ways of G-d? Is his learning reason enough to make him more qualified to ask the same questions? I was quite surprised that none of you asked this all important question, especially you who never met a Charedi they liked. Last but not least, and probably the most defining trait of Menashe's character, is his admonishment, or his telling her that in reality she has what most others don't have, a Ba'al Toyreh, a man of Torah. (As opposed to a Ben Torah?) While other wives need to contend with boors who never went past sixth grade if any school at all, she has a man who fills his life with the study of Torah, and that should suffice for her, although she has no idea what he does when he learns. A Chossid would never speak that way, (although Elkonoh did speak to Chanah that way) and would never "pound his chest" to others. That would leave me to believe that Menashe is a classic Misnaged, a man who's very worried about his Kovod HaTeyreh. Yet, his Emunah is not that of a typical Misnaged, it's that of a Chossid who's been working on his Middos and has rock-solid faith after all that work. So, that's where we stand; we're perplexed, we can't get a clear picture of this Menashe. Then again, it's only a song, and probably written by an "enlightened" Jew as well. "Once there was a woman whose husband would only eat fleishig (meat dishes), which she dusifully prepared for him. Their daughter came to marry a man who would only eat milchig (dairy dishes). Not wanting to deprive her son in law, the mosher in law prepared for him, as well, the food he craved. For several years this practice continued, with father and son in law eating in separate rooms. Now, it came to pass that the family became impoverished and could afford neisher fleishig nor milchig. The woman was compelled to cook potatoes for both her husband and son in law. Nevertheless, the two continued their custom to eat in separate rooms. After several years elapsed in this manner, the two realized that there was, indeed, no point in their remaining separated and finally came to dine together." 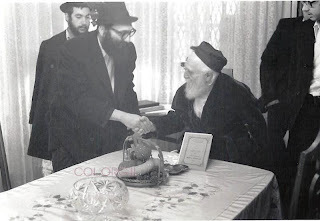 HaRav Reb Moshe Feinstein ZaTZaL with Lubavitcher Bochurim on Chol HaMoed Pesach 5738. They were the second group of bochurim heading to the Yeshiva Gedola in Seattle. Their Rosh Yeshiva was Reb Leibel Kaplan, currently in Montreal, Canada. They brought with them a kovetz of chidushei torah published by the bochurim. NOTE: Some Halting of Kup may be needed here. I haven't thought this one out as much as I needed to, so the continuity here, the flow necessary to understand the writing of a guy like myself, may not be present here. VeItchem HaSlichoh. In a way the Yeshivisher Oylem has lost its love and devotion to its Rabbeyim, but maybe they're not all to blame. 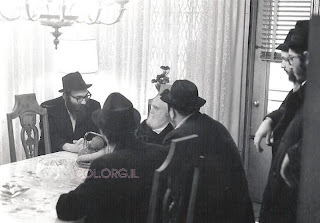 Yes, we see lots of pictures of Reb Chaim K and Rav Elyashiv in the papers, and yes we see Rav Aron Shechter "dancing at the Rabinowitz-Prager wedding in Passaic," but it's all a mirage. 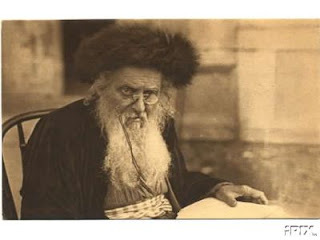 In the old days you see pictures of giants like Reb Boruch Ber sitting on the grass or in a lawn chair and his Talmidim around him. They went with him on Datshe, and he didn't seem to mind having them there. Today no Rosh Yeshivah wants to be bothered with a bunch of Talmidim hanging around and observing his every move - and maybe rightfully so, I wouldn't want that either - and especially not when he's on vacation. far Reb Boruch Ber hut yeh gepast to sit outstretched on the grass in Druskenik or suburban Vilna without his Kapote with a Sefer in hand, but for today's sheine Roshei Yeshivah past es nit. Maybe that's why the end result, the final product of the Yeshivishe Velt if you will, is not what it used to be. We speak about this Yeshivah and it's Shnit, and how it's been lost on today's youth, but we fail to realize that most of today's youth cannot handle what it takes to make something of yourself. Most Bochurim didn't go to Slabodka all "cut out" for that particular Yeshivah, they were good kids who wanted to learn and make something of themselves. The additional character traits that Slabodka added came later, and after much effort to internalize the teachings. Some never did internalize the shnit and just made a name for themselves throught the Torah they learned there. I would dare say that the Kletzker/Lakewooder Rosh Yeshivah wasn't a Slabodker per se' , he just happened to learn there. You can argue that point. The same would go for Rav Ruderman. The Dolhinover may be the exception of the three, with a quasi legacy of Mussar and working on Middos, but did he go there just to drink from the well of Reb Nota Hirsh Finkel? I don't believe so, but I've been wrong before. Just to make it fair, I'll go out on a limb here, and say something that my Lubavitcher friends may not agree with. I may also be accused of being a Nifred and a Ungarisher Ferd, but so be it. I believe that in today's day and age Chabad too suffers from that devotion, although to a lesser degree. A Lubavitcher may think of himself as having a strong identity, and of being very much a Chabadnik, but often that's not the case. A Chabadnik today needs to have several things: (in no particular order) 1) a strong sense of bringing Jews closer to Yiddishkeit, 2)a strong desire and Geshmak in learning, Nigleh that is, and 3) a head for learning and understanding Chassidus Chabad. Without it he's somewhat incomplete because he cannot do his part in either learning Chassidus Chabad BeHavonoh VeHasogoh, being Eysek in Hafotzas HaYahadus, or learning Teyras Rabbey Vi es darf tzu zein. I therefore have this svoroh that not all Bnei Chasidei Chabad have what it takes to carry the torch and become Lubavitchers themselves, unless we change the curriculum in some Yeshivos, or set up Yeshivos where less time is spent on Chassidus. More on that at a later date, B'ezras Hashem. I've had this tape of Chazzen Mordche Hershman for a while now, but never really paid attention to this song. It's somewhat difficult to listen to, with the old Mono sound and his high-pitched voice, but I think I got it. Now, with the help of Google and some Yiddish websites, I think I pieced together the whole song, and even figured out the Russian words that some versions have. Hershman does sing it with a Ukranian accent, using Vi in place of Vu, and Broocheh in place of Brochoh. I used the Zemerel website of Yiddish Songs for some of the Russian Words, as well as The YiddishLyrics blog for the Yiddish fonts and lyrics. 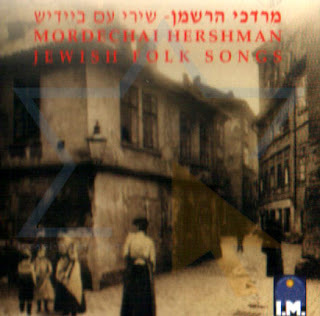 For some reason, on the Zemerel website they classify this as a song of "suffering," failing to realize that although it may be partially about suffering, the main point here is the trust in Hashem that Der Alter Menashe has, and how he doesn't allow his financial situation to keep him from learning Hashem's Heylige Teyreh. דו ביסט דאך א טאטע! Maybe some of our Russian friends here can help us out on the exact Russian translation, although most of the words I could figure out myself. We were doing quite good beforehand too, but nothing like this. I realize that it was a one-time deal, and that soon it'll be back to normal, but still. I see that if I get the Yeshivishers and the Satmarer involved this blog can really go places. I was helped by links on a Satmarer forum on HydePark, and links from such sites as OnTheMainLine, AtTheBackOfTheHill, and DixieYid. Chaim G also was kind enough to promote his post on DovBear. The Lubavitchers are too busy discussing Cunin and Shemtov over at mentalblog, so maybe I should change the course of Circus Tent. I'll need to discuss this with my Mashpia. ---- For The Volozhin Revolution. Here’s the point: Rav Chaim Volozhiner's revolution is truly over and we may as well fix Gimel Tamuz as its yohrzeit. Here’s what I mean. Volozhin is conventionally credited with being “the mother of Yeshivas”. Yet we all know that Yeshivas have been part and parcel of the Jewish experience since Har Sinai. 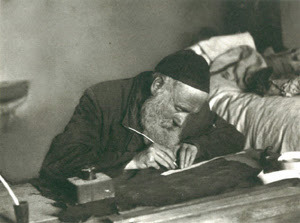 What Rav Chaim Volozhiner innovated was the concept of a free-standing institution that could transcend and outlive the intellectual and spiritual giants that incubated it. In contradistinction to this we find the Litvishe/Volozhiner Yeshiva revolution. Slabodka was not Mir, was not Grodneh, was not Telshe, was not Kelm, was not Kaminetz, was not Novardhok. Each Yeshiva INSTITUTIONALLY had its own wrinkle in Lomdus and, where applicable, in mussar. One was not a “vanilla” yeshiva man. Stating his Alma Mater could give you a pretty good notion of his Weltanschauung. At that time Brisk was just another (OK, perhaps the brightest) star in the Yeshiva constellation. It was not the totality of the constellation. Up to a generation ago this obtained in the American and Israeli Yeshivesha velt as well. Baltimore, Telshe, Chaim Berlin, Torah Vo’Da’as and Lakewood, Chevron, Ponovezh and Mir all had a distinct shnit. Lakewood, especially, had feeds from its branches headed by R’Ahron Kotler's zy”a talmidim Philly, Denver, Scranton and Long Beach. 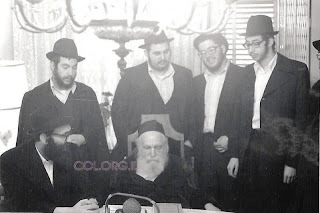 In that era the ambition of bochurim was not to go to Avrohom Yehoshua (Reb Berel z”l) but to make it to their own Roshei Yeshiva’s shiur 3-4 years after high school, and then on to Lakewood. Having been mechunach by R’Ahron Kotler zy”a talmidim, they were "Lakewood type" guys way before they even got to BMG, the flagship school. All this is dead today. We have come full circle and are back to “personality cult” Yeshivas. 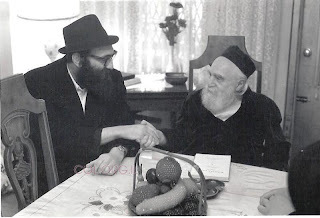 Can anyone imagine Passaic absent Rav Meir Stern? South Fallsburg without Rav Elya Ber? Patterson (I think) without Rabbi Swerdlov? IMO l’akher meah v’esrim these Yeshivas will all fold like cheap cameras and any Ba’al Tzedaka investing big money in buildings is wasting assets on diminishing returns. Don’t believe me? Just take a look at the turmoil in Philly and Long Beach over the last 6 years where the long-time Roshei Yeshiva are still alive but are simply not well. They provide instructive cautionary tales. IMO the reason for this phenomenon is not due to a lack of scholarship but due to a constriction and closing of the Charedi mind. Despites all the wailing and moaning about makhlokes and lack of unity today’s frum world is not just (externally) frummer than that of a generation ago, it is much more monolithic, monotonous and monochromatic. The great cacophony of voices has been stilled, and the marketplace of ideas has closed shop. 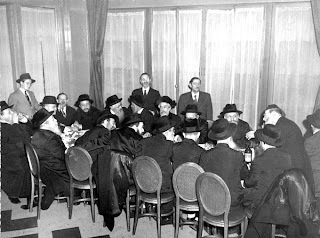 The great debates of lomdus vs. mussar, Zionism vs. anti-Zionism, secular education vs. full-time, long –time limud HaTorah have all been settled with (respectively) Brisk, the Satmar Rebbe and Rav Ahron Kotler the victors and Rav Yisrael Salanter, Rav Kook and Rav YB Soloveitchik the losers. Any die-hards who think otherwise are either too scared to express their minority opinions, or as oblivious to the facts-on-the-ground as the Japanese fighters convinced of the Emperors desire for them to keep fighting World War II to the last man as late as 1949. And so, Satmar had gained pre-eminence ideologically as Brisk has in Lomdus. In this ambience where there is only one flavor in the ice-cream parlor the only choice remaining is “who makes a better , richer, more authentic Vanilla”. Forget about Chocolate and Strawberry, let alone Mocha or Pistachio. No one is interested in hearing shiurim in the style of Rav Shimon Shkop or (SHUDDER) the Avnei Nezer. No one is inspired by mussar/hashkafa in the style of Rav Elya Lazer Dessler or Rav Yerucham. The only factor in a given mosad/ magid shiur/ communities “attractiveness” is how well does it approximate/ how quickly can it gain me entrée into… Satmar and/or Brisk. In religion the frummer, the more extreme, the more anti-Zionist/Goyim/modernity/secular education the better. In education, the more Brisk the lomdus (and the better the track record of acceptance by Avrohom Yehoshua) the better. No popular Yeshivas extant today will remain popular after the death and/or infirmity of their Roshei Yeshiva because whoever is the supreme "Brisker Lamdan" of the moment, and/or crony of Avrohom Yehoshua will then attract the best Bochurim. And so I find all these expressions of shocked disbelief over BMG inviting the Monroe Satmar Rebbe to be the keynote speaker on Rav Shneur's z”l Yohrzeit comical. Lakewood stopped having a personality of its own even B’Chaim Chiyuso of Rav Shneur. Every place today is a satellite of Brisk and Satmar. 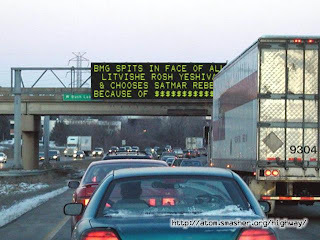 As there is a long-standing the family feud between the Kotlers and the Soloveitchiks, and with a little D’var Torah Mo’ois Koinois to sweeten the pot, no greater kavod could’ve been rendered Rav Shneur’s z”l memory than to showcase the titular head of the movement that defines the stripe of Yiras Shomayim, not merely ascendant, but in monopoly-like control, in contemporary frum, Judaism. I'm no Talmid Chochom, nor do I claim to be one, but if he tried to impress me he didn't. The Satmarer seem to think that we have the Godol Hador here. Good for them. Reb Malkiel zol gezunt zein also seems mesmerized, for whatever reason. Rabbi Neuman is not impressed. It's not the content that's the problem, it's the delivery, the tone of voice, it turns me off, but that's just me. I'm a Moroh Shcheyreh'dike guy. I also don't think that the shiur was soooo Gevaldig, but that's my Ameratzis speaking. I know the Taam but I don't know the Kikar. For those of you that may not know, Gimmel Tamuz is the 25th Yohrtzeit of HaRav Reb Shneur Kotler, z"l, Rosh Yeshivah of BMG in Lakewood, and father/father-in-law of the four current Roshei Yeshivah. Believe it or not, I attended that Levaya in front of Yeshivah Toras Emes - Kamenitz in Boro Park, but that's for another time. As the above picture will tell there will a big gathering in Lakewood tonight in honor of this event. The guest speaker - rather the "Divrei Torah BeHalochoh VeAgodoh LeKoved HaSiyum" - wil be presented by the Satmar Rebbe from Kiryas Joel, Rabbi Aron Teitelbaum. This tidbit has raised many a eyebrow in the frum community, with many wondering how the Satmar Rebbe was chosen for this honor, and why Lakewood, with it's thousands of Talmidim of Reb Shneur had to reach so far as to find a speaker. If a suitable Talmid of Reb Shneur could not be found to speak in Halochoh on this night, surely one of elderly Roshei Yeshivah, the survivors of the Golden Age of Litvishe Yeshivos if you will, could've been found. The booming growth among Charedim in general, and among "Rebbishe Kinder" in particular has given birth to a new problem, a problem we can all live with, really. Rebbishe Kinder today have re-written their own rule books and now have this rule that none of them can actually work in the real world. Gone are the days when you'd see them on 47th Street at the Diamond Exchange smoking their cigarettes and talking business with other Jews. Shabbos was another story, of course, with the weekday businessmen shedding their weekday mundaneness and donning their Shabbos finery, and becoming Rebbes and Rebbishe Kinder again, leading the services in their shuls across New York. Those were the days when the older generation had to actually work to support themselves and the generation boom was about to happen. They knew that raising and marrying off all those children was gonna cost a pretty penny, and somebody had to pay for it, so they hopped the buses and trains and did what any self-respecting man would do; they went to work and make a living. Today is another story. No self-respecting RK would get a job today that compels him to actualy deal with people, buying and selling and negotiating over mundane objects. It's not becoming of a man in a Bekishe in the weekdays to be seen on the train or even the Yiddishe bus with all the Amcha Yidden crossing the bridge/tunnel into the city every day. This new mindset among the Rebbishe (which stretches very far these days) has given birth to a new class of young men who cannot work but are not cut out for full-time learning in Kollel either. Some get jobs as Maggidei Shiur and Shoy'el U'Mayshivs, but those are limited. When I was as kid there was a RK who had a shul who was a Melamed in a BP cheyder, that wouldn't happen today, it wouldn't be good for business. So the young RK who gets married today usually goes to a Kolel outside his Kreyz and sits there for a while. There the other Yungeleit won't sit and bad-mouth him, and he'll do his thing in peace. A Vizhnitzer BSh"K goes to the Gerrer Kolel, and the Skverrer BSh"k goes to Ch'san Sofer, and nobody's the wiser as to how he spends his days. That lasts for a few years. 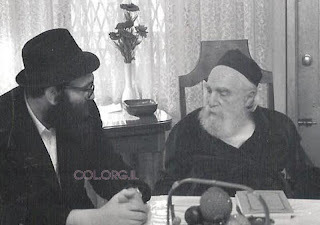 Reb Loozer Brizel passed away last week at the age of 97. He was a Galicianer Yid from a family of Sanzer/Shinover Chassidim who discovered Karliner Chassidus in Yerushalayim and never left. (He remained a Galicianer Yid somewhat, with his Kano'us for Yerushalayimer Minhogim and Levush, something I don't think he learned in Karlin, but you can argue that point.) In many ways Reb Loozer was the one who allowed for Stolin to wait around till the present Rebbe was of age to take the leadership mantle. Had that not happened who knows where they'd be today? Many left right away to Reb Moshe Mordche of Lelov, a Chossid of Reb Yochanon of Stolin, his brother Reb Zalman among them. Others waited around and left anyway years later, when Stolin split from the Eidah HaCharedis and began to receive state funding, a cardinal sin amongst Kanoyim. 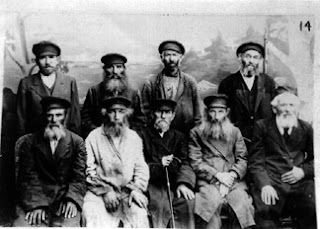 Reb Loozer was a traveling "Kiruv" organization, spending most Shabbosim away from home in cities and towns across Israel, awakening Jews to become closer to Hashem. He was also an active leader of the Vaad HaTznius, not looking after wrongdoing, and not harrassing "Shababnikim," but rather trying to correct and prevent the secularization of Yerushalayim. He was the one instructed by the Beis Yisroel of Ger to put up the Mechitzah at the Kosel after it was captured in the Six-Day War, and he got his way, against the better wishes of the Government. 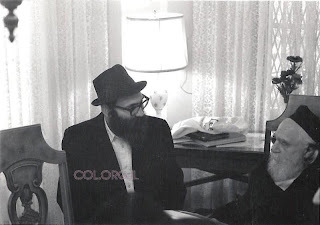 He would "live" with his first Rebbe, Reb Avrohom Elimelech of Karlin HaYaD, who was killed during WWII, and would say that the Rebbe's blood "Kocht zich noch" and knows no rest. This after more than sixty years had passed. 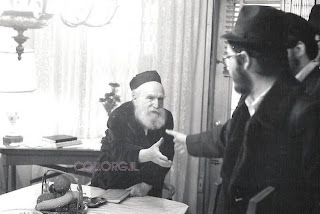 I had the good fortune of seeing Reb Loozer quite often as a Bochur in Eretz Yisroel, and saw his complete devotion during davenen and tishen. "Chumming the water with Snag bait"
chum: bait consisting of chopped fish and fish oils that are dumped overboard to attract fish. as per Google. I don't think I chum, really now. You're a Yid from another world, another generation. You managed to survive the horrors of your family and friends being murdered by a coincidence, because you just happened to be away overseas. You become part of a new Yeshivah in the New World. The Yeshivah grows and prospers, and you live to see real Nachas from your Talmidim. A bochur who has been learning in your Yeshivah for quite some time now. He's a good bochur by anybody's standards, learns and davens, keeps the Sidrei HaYeshivah, and is exceptional with his fellow students. He never hurt a fly. (Close to fifty years later this Bochur, now a Zeyde, is still the most Aydel person you'll ever meet.) One day this bochur - let's call him Yankel - comes up to you and tells you that he'd like to travel to City A to see his Rebbe. He's asking for your permission, not "letting you know that he's going." Why does he want to go to his Rebbe? Because his Rebbe is going to sit and talk Divrei Teyreh for 6-7 hours, and sing some Niggunim. Remember that he's not asking to take two days off to travel to a friend's wedding to Hulye and be merry. No, he just wants to hear Teyreh from his Rebbe. There's only one little problem. For whatever reason you don't like his Rebbe, you think he's weird and maybe outta line with some of his statements. You know he's a great Talmid Chochom and has made it his life's work to bring Jews closer to their father in heaven, but he still can't find favor in your eyes. Maybe it's the fact that you don't like his circles, and maybe it's just him. Either way you just don't care for him. You know that your Talmid is his follower, yet he does nothing that makes him any different than the others. 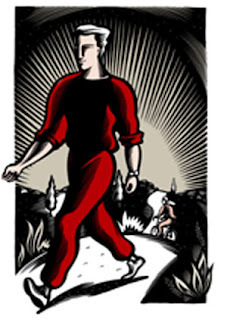 On the contrary, he excels in all that he does, and all with no fanfare, never making much of himself. Now that this young man comes to you and kindly asks your permission for a day off you're greeted with sort of a dilemna. 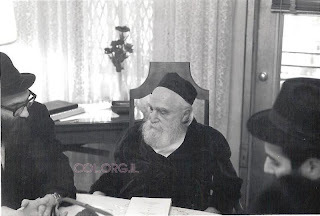 Do you allow him to go and be inspired to improve his studies, knowing that he's in "good hands," or do you forbid him to go because of petty differences you may have with his Rebbe; something you knew when you accepted this young man into your school? Some of you may wonder how the son of a Telsher Talmid, who never really became a "Telsher" per se', made the switch to Lubavitch. (Others may not care, and say good riddance to me and my family, so feel free to close this window if you don't care.) The answer is that this is not without precedence, at least in a roundabout way. You see my friends, the Yizkor Book for Rakoshik, Lithuania is chock full of very interesting information. 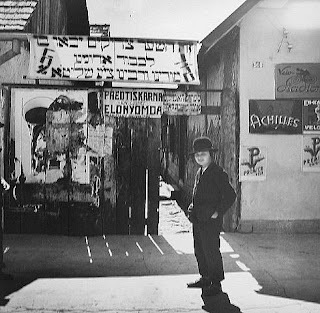 Raskoshik was considered a Lubavitcher, or rather a Chabad shtetl, with most of the inhabitants Chassidim, Lubavitcher, Kopuster etc., at least until Haskoloh took a bite out of her too. 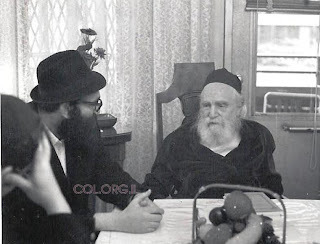 One of the last Rabbonim was Reb Shmuel Levitin z"l, a close Chosid of the last 3 Rabbeyim of Lubavitch, and there was also Pinye Rakshiker, a "Derhoybene Chossid." 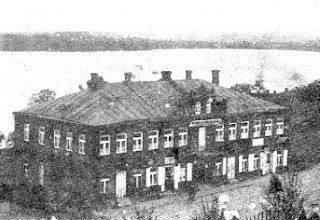 But being in Lithuania made these Chabad Chassidim unique in more ways than one. We'll touch on one aspect of that here. It's interesting to note how the writer of this part of the Rakoshik memoirs, I believe an irreligious Jew at the time, still finds it necessary to differentiate between Telshe and the other Mussar Yeshivos, and holds Telshe to be on a higher level than the rest. In Telshe there was only learning Torah, no Mussar, no being busy with "character refinement" like other Yeshivos, (Slabodka, Kelm, Ponovezh) only learning Torah. That's why, he says, Telshe was the appropriate place for Chabad Bochurim from the region. Chabadniks are Kalte Chassidim, Moychen over Middos, and Telshe was just like it. The only difference was during the short Mussar Seder they learned Tanya instead of Mussar, otherwise they were part of the fabric of the Yeshivah, and were the leaders and doers when it came to leading Yeshivah functions such as Purim and Simchas Teyreh, and were the organizers of all kinds of Chesed. There's been some talk about it recently, with another Professor supposedly "exposing" the Rebbe for his true stance on the Holocaust. Biz Yetzt hut men Gevust that the Rebbe said that we can't understand Hashem's ways, and in no way do we say that the Holocaust was somehow a punishment for the Jewish people. Now, this Professor says, we find out from a well-known letter written by the Rebbe in 5740 to the former head of one of the underground movements during the Holocaust and later Israeli MK, that it was a kind-of "surgery" to remove a diseased limb from the Jewish People. Read it. Click on the link above. I see this now more than ever before, and I believe many of you will now agree. If anybody comes to you - given that you're a Bochur or Yungerman - and asks you where you're at in "Inyonei Kedushah" VeChuli, whether you had "difficulties" you'd like to discuss, if there are "thoughts" or "feelings" you have, run like the wind, and never be alone in the room with him. If you can't do that, for whatever reason, tell him you have a phone call. Why would I say something like that? It's quite simple. The Tzemach Tzedek takes the approach BeNogeah to Shmiras HaBris, that it's best not spoken of, and that Hesach HaDaas is the way to go, because otherwise one becomes obsessed with it and it keeps him from doing what he needs to do in life. Someone who does talk about it all the time seems to be obsessed with it, and hence the fear that he may just act on it. Of course I'm not negating other approaches (well I am actually) but I see this as an Halochoh Psukoh that should be made law elsewhere too, Ger and others not withstanding. I don't doubt the holiness of the Gerrer Rebbe, the Beis Yisroel, but I fail to see where non-stop thought of it brings to Kedushah VeTaharah. More proof to my theory can be brought from a story told of the Rebbetzin Rivkah, wife of the Rebbe MaHaRaSH of Lubavitch, and scion of Bais HoRav herself. 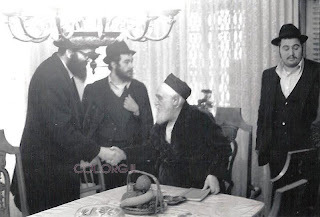 (The Rebbe Rashab, her son, called her a Chassidisher.) She once chanced upon a Machzor for Yom Kippur while browsing the wares of a Mocher Seforim who came to Lubavitch. Judging from her reaction it seems like she had never seen it before. She saw the Tefillas Zakeh and began to read it. Those of who know will know that it speaks of doing Tshuveh for the Cheyt HaYodua. After a moment she closed the book and said (Feh) "Doh shteit zachen vos m'tor afilu nit trachten!" How much more so that it should not be discussed in public. Sifrei Chabad are full of the gravity of the sin, and about ideas for Tshuveh, but never was it a topic of discussion in public, it was always something you did on your own. I made mention of the fact that my Ungarishe Kup didn't see as a given the fact that the story about the Rebbe's library in 770 being flooded due to neglect on Shturem was related to BLevine's recent war against BLazar in the FSU. Berl, CH made me aware of that, and he saw it as a no-brainer. 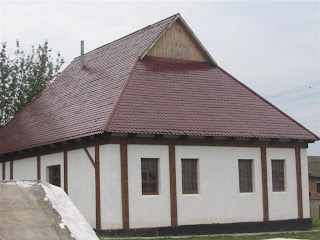 Some of you, especially those who don't understand the nuances and cultural differences that are present in the Ungarishe/Heymishe Velt, might be surprised at that, knowing what some of our Hungarian brethren in Williamsburg are quite capable of for generations, and what our Rumanisher/Bukoviner/Marmurisher brethren in Bnei Beraq (I mean you Vizhnitz) have shown recently. Why then would I point to my Hungarian heritage as the culprit for my naivete'? Isn't it pretty simple and almost second nature to me? The aswer is quite simple, my friends. You need to understand that just like in Kabboloh we say that all Eser Sefiros are themselves made up of ten, so too are Hungarians/Heimishe made up of very different types, and one should never be confused with the other. The Hungary I speak of is not the dusty Transylvanian towns that Eli Wiesel speaks of, no siree. It's not the corn-bread eating Jews with beards and Peyos that spent all of Elul preparing to spend Rosh Hashonoh with the Rebbe. It's not the ones who would immerse each day in the Mikveh and wear two pairs of Tefillin at Shacharis. 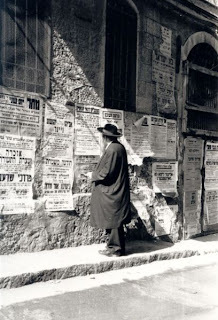 It's not the ones who would be consumed with talks about this Rebbe and that Rebbe, and this Meyfes and that Meyfes. No Shtramel/Bekishe for them, although the German Tzilinder (Homburg hat) held an equal amount of importance to them. My ancestors were Jews who lived strictly by the letter of the law, without the extra trappings that Chassidim added to their daily practice, part of which later became fighting with other Chassidic groups over BaalBatishkeit in towns and cities, and fighting over which Chassidishe Nusach should rule in their town. These Jews, being that they were Temimus'dik and knew little Chochmes, were known as Ungarishe Naaronim. They were the Jews of Hungary proper, of Miskolc and Niregyhaza, of Pressburg and Erlau, although they're more Austria than Hungary. Most of the dirt that goes on in the Heimishe Velt today can be traced to the other Hungarian Jews. Not the Naaronim, but the Chazeyrim, the Ganovim, those who you needed to watch your pockets from, well at least you had to in Di Alte Heim. Most of it can probably be traced back to the strong power wielded by Satmar, and the want and need by the other, much smaller groups to find favor in Satmar's eyes. The small Hungarian groups go about their business, earning a living while being Kovea Itim and supporting institutions of Torah. They have no time for fighting, unless they become more "Chassidized." A proud Hungarian Jew would turn his nose at his Marmurishe brethren, much like a MO would do to a Chossid with a dirty Tallis Koton and Rekkel on the train in 95 degree heat, not that I advocate that hate. He would call him a Rumanisher Chazzer/Ganiff and didn't trust him for a split second. Where does all this lead, and what does it accomplish? not much, if anything at all, it just serves as an educational tool, teaching our unfamiliar brethren about the differences in Jewish culture. 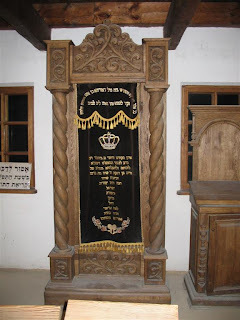 NOTE: TODAY THE 22ND OF SIVAN IS THE YOHRTZEIT OF THE KEDOSHIM OF THE KEHILLOH OF SAJOSZENPETER, HUNGARY, HOME OF MY PATERNAL ZEIDE AND BOBBE'S FAMILIES. THEY WERE EXTERMINATED IN AUSCHWITZ DURING THE TERRIBLE SUMMER OF 5704/1944. MAY HASHEM AVENGE THEIR BLOOD, SPEEDILY IN OUR DAYS. It seems to me that the perception in today's world is that you're measured to be a successful parent by your children. In other words, a good parent has good kids, and a bad parent bad kids. Simple enough. I'm guilty of thinking like that as well. The same would go for Rabbonim and Roshei Yeshivah, if they have good Talmidim that would make them good Rebbes. Speak to any Hungarian/Rumanian Yid or any of his descendants and he'll tell you how they were the best of all the Jews, and look how successful they were, and how unaffected their children were by any of the movements that were so popular elsewhere. The only problem is that in retrospect it makes the Tzadikei Oylom of yesteryear look like failures, because look what happened under their watch. The failure rate was astronomical, it was almost as if they didn't exist. The disdain that existed in the hearts of many to the Rabbonim and Tzaddikim of that generation, people who never harmed anybody, is impossible to believe, yet Davke they were the recipients of such hate from their own brethren. We all know about the Frierdige Rebbe and Nachmanson and Lulav, children of his own Chassidim who mocked him openly for no good reason. 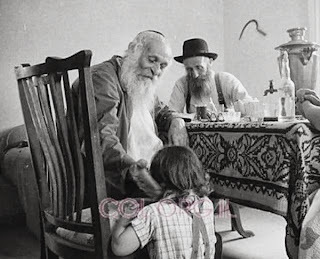 The Rebbe never hurt them, yet they physically abused him. So the theory that good people make good kids and Talmidim doesn't work here. The same goes for today's children; I know of compulsive gamblers and wife-abusers who had Tchachkes for kids, one better than the next, and Tzaddikim who were good parents who had zero success. Go figure. G-d works in mysterious ways, and only he knows why. "I find it funny that I, who spent considerable time there, am nogeia b'davar to give an opinion, but those who never stepped foot there and most likely never will (and if so, for only a short time) can give an opinion. Let me tell you all, don't believe me . . . Go fly out to Vilnius and spend time speaking to the local Jews in Lithuania. If you need internet I can recommend a good internet cafe for you to e-mail me your results from. As well, throwing in Moshiach matters has Zero connection to the story at hand. We're speaking about a very small community here, where two shuls are not needed . . . but in any event Rabbi Krinsky runs things from the Chabad house which is a de facto shul. Let us get a few facts clear: The fight here has nothing to do with Nusach, Minhag, or the Gr"a. It is about money and restitutions. Period. For ten years no one had a problem with Chabad . . . until money came into the picture. The government planned on giving the money to the Religious community, i.e. to the Rabbi. Rabbi Krinsky wouldn't capitulate with the powers there, so they brought in Burshtein as a Rav Me'taam - he may do good things, but he was brought in to get the money for the coffers of the Kehilla. To draw in support, and to present a better image, they dug up the old hatchet and used the 'misnagid' card. Rabbi Krinsky may be stubborn . . . it may be part of the problem . . . but it's his akshonus that kept him there for so long. Let me see one of you illuyim live in a third world country, shecht your own chickens for meat (bosor beheyma is a chidush there for speical occasions), import your milk, taken in an orphan and the like . . . all while running a school for ka"h one hundred children, sedorim for several thousand and the like. A person, not a Lubavitcher, visiting once asked me for the inside scoop on the politics there.I told him, "There's no problem with people who go the shul and not to Chabad . . . The problem is the thousands of other Jews who go neither the shul nor Chabad." The other side threatens people, tells them to stay away from Chabad -or risk losing access to their soup kitchens, camps for their kids and the like. That's what's wrong about all of this . . . that the local Jews are cowed into submission and end up staying away from all Judaism." 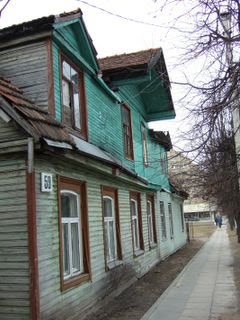 See his pics from Lithuania. NOTE: NO NEW COMMENTS WILL BE ALLOWED HERE, FURTHER COMMENTING SHOULD BE DONE IN THE ORIGINAL THREAD. A story that illustrates the point of view that one must not rely on the Davenen alone helping him with his problems. He must do. He needs to try and rectify the situation himself. fun der yidene shteyt a yid un er hert vi zi shrayt un bet. azelkhe toyves shikt men nisht ka hunt -- me geyt aleyn!" I'm sure he looks inward at Lubavitch and asks the same question, just not in this article. Then again, scrutinizing others is a far easier task than doing it to yourself. To all you "myth-busters" and Kool-Aid drinkers: I guess when they taught you about Reb Elchonon HaYaD being the Rabbon Shel Kol Bnei HaGolah, and at least in full control of Baranovitch, and Lita being chock full of Shas Yidden wasn't qute true. Some slipped through the cracks. Actually some DIDN'T slip through the cracks, most did. About 85 percent of them. So, just a block or two from the Yeshivah Ohel Torah in Baranovitch, where Reb Elchonon gave shiurim and wrote the Kovetz Shiurim material, and where Reb Yisroel Yaakov Lubchansky preached Mussar to the Bochurim, this is was what going on. Shirtless lads were doing their best young Abe Lincoln impressions, splitting logs like nobody's business. If that's what you call control then so be it. The Cossack Chaim Burshtein, a despicable excuse for a Jew, wants it all. He won't be happy till Krinsky is a thousand miles away, and Vilna is Chassidimrein. I just don't understand why there's no money for Krinsky, when the rest of the FSU seems to be doing just fine. I guess that's explained somewhat later in the article, with Krinsky's status still upin the air as far as Chabad FSU HQ is concerned. In any case the hypocrisy of the Chossid haters screams out to the heavens. The self-righteous act they put on still seems to work however, no matter how lying and hypocritical it may be. I guess when you have an all-powerful newspaper doing your dirty work, and with the help of untouchable old Roshei Yeshivah, the Eylem Geylem will buy anything you sell. 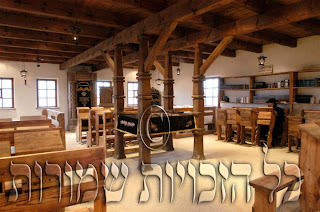 The shul was recently restored to look like it did in the old days, with a modernized look of course. Which reminds me of a conversation I overheard about recent attempts by elements within the Snag community to paint the Besh"t as someone who Poshut didn't know how to learn. These guys think that a RaM in a Yeshivah in New Jersey, who "learned by Reb Berel", really could dissect a Shtikkel Gemoroh better than the Kodesh HaKodoshim. Zol zei voyl Bakimmen. As if the Maggid of Mezritch and the Toldos Yaakov Yosef would ever join the ranks without the basis for it all being Torah. Which leads me to believe that serious brain damage is what's in these days. The more damaged you are, the higher up the totem pole you are. Has this blog changed your opinion of Lubavitch? א יונגערמאן אין עולם הזה trying to do what's right. The purpose of this blog was to provide a counter opinion to the Chabad bashing that is so prevalent in blogosphere. I hope I've accomplished that objective. This is the blog for you if you have a decent knowledge of Jewish history and current events. כל הזכויות שמורות להירשל ציג - Copyright Hirshel Tzig. Watermark theme. Theme images by A330Pilot. Powered by Blogger.